Eliud Kipchoge from Kenya is the new Olympic marathon champion. On the final day of the Games in Rio, Eliud crowned his career with his sixth and most important consecutive marathon victory. In moist and warm conditions, the 31-year-old ran to a commanding win in 2 hours, 8 minutes, and 44 seconds over Ethiopia’s Feyisa Lelisa who finished in 2:09:54. Galen Rupp of the United States produced a sensational performance in just his second marathon to take the bronze medal in 2:10:05. The World champion, Ghirmay Ghebreslassie of Eritrea, finished fourth in 2:11:04. 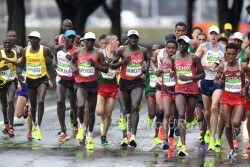 The race heated up between 15.5 and 20 miles, with Eliud Kipchoge putting on the pressure to reduce the leading group from 35 runners to just four. Six miles from the finish only the Ethiopians Lemi Berhanu and Feyisa Lelisa, along with Galen Rupp, were able to stay with him before Lemi Behanu dropped off the pace. 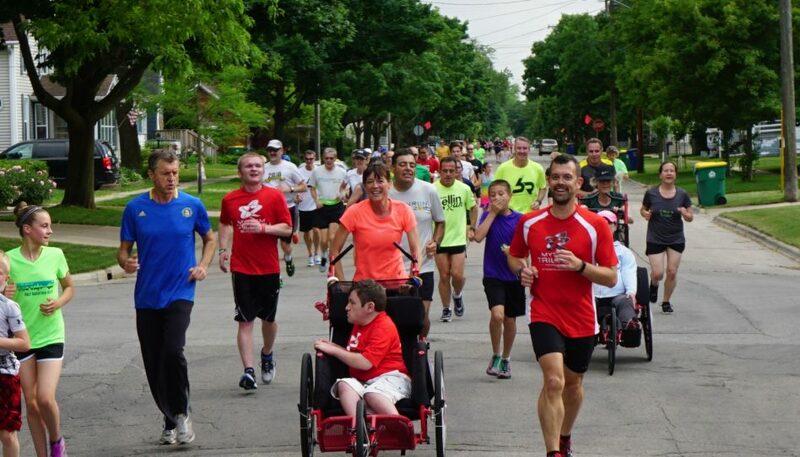 The 5K split after 21 miles was covered in a blazing time of 14:25—good enough for world-record pace! 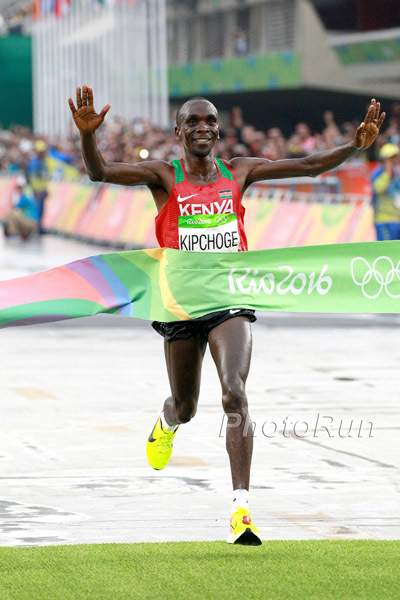 But, as expected, no one could match Eliud Kipchoge’s injection of pace in the closing stages. Galen Rupp lost contact shortly after 21.7 miles—and Eliud made a sign to his last remaining rival, Feyisa Lelisa, urging him to do his share of front running. When the Ethiopian marathoner did not respond, Eliud, the Berlin and London Marathon champion, went clear at 22.4 miles and ran to victory alone from there. The Kenyan athlete’s strength was illustrated by the two half marathons he ran in Rio: he went through halfway in the big leading group in 65:55 and ran the second half a good three minutes faster in 62:49. For the first time since the 2000 Olympics in Sydney, German runners were represented in the men’s race. 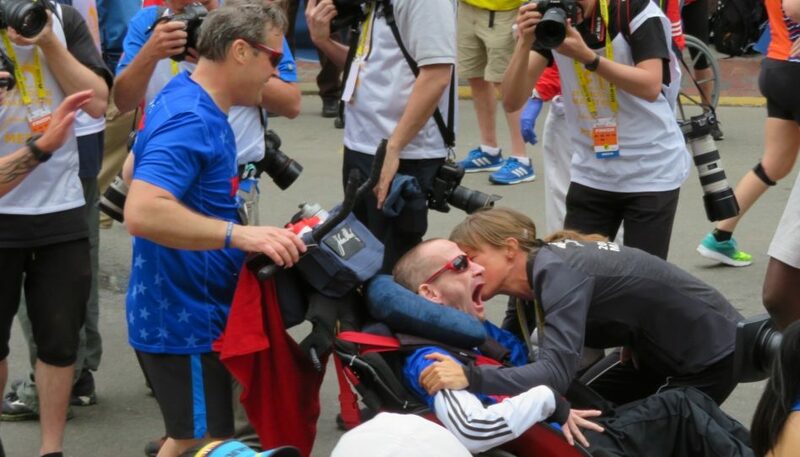 Philipp Pflieger crossed the finish line in 55th place in 2:18:56, and Julian Fluegel, who only a few weeks prior to the marathon received a spot as a substitute on the German team, was 71st in 2:20:47. One half of that Olympic Marathon history was made earlier when Jemima Sumgong became the first female runner from Kenya to win the women’s gold medal. 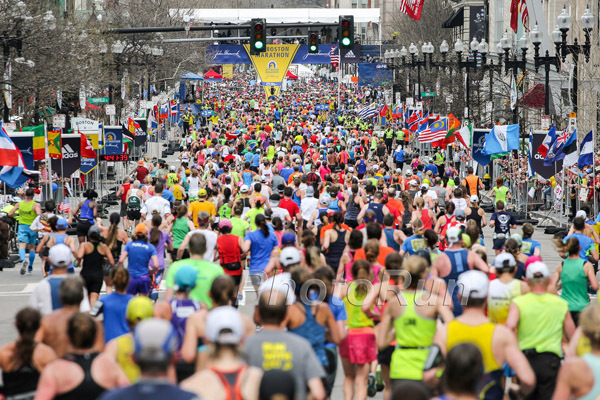 Jemima prevailed despite the warm, 77-degree temperature, crossing the line strongly in 2:24:04, ahead of Eunice Kirwa of Bahrain and finished in 2:24:13. Sadly, the winner was months later banned for drug violations. The reigning World champion in the marathon, Mare Dibaba of Ethiopia, took the bronze medal in 2:24:30. Fourth place went to her fellow countrywoman Tirfi Tsegaye in 2:24:47 ahead of Volha Mazuronak of Belarus in 2:24:48, with Americans Shalane Flanagan (2:25:26), Desiree Linden (2:26:08), and Amy Cragg (2:28:25) placing sixth, seventh and ninth respectively. German runner Anja Scherl, 30, kept her pace in the difficult conditions well and finished 44th in 2:37:23. The twins Anna and Lisa Hahner placed 81st and 82nd respectively while crossing the finish line together: Anna ran 2:45:32, Lisa was one second slower. 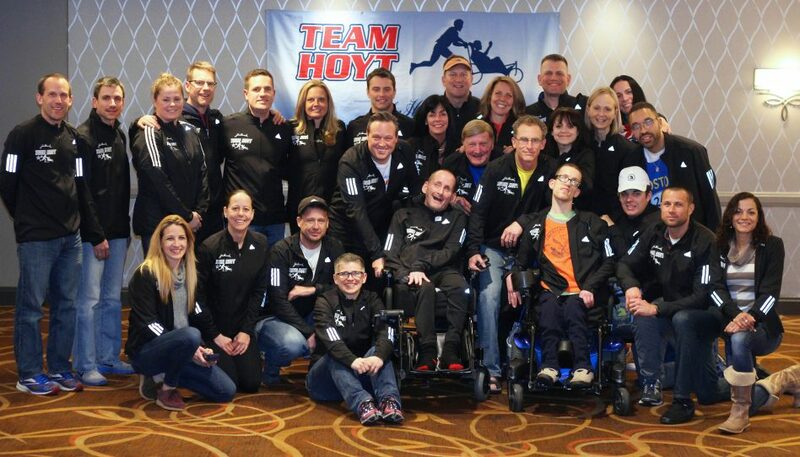 It was not an easy race for Anna, who was set back in her marathon preparation after a biking accident. Before the race, the 31-year-old Jemima had been considered a strong favorite, following her victory in the spring in a highly competitive London Marathon—despite a fall during the race. In the last few kilometers in Rio she was able to distance herself first from Mare Dibaba and finally, just a kilometer from the finish, Eunice Kirwa. 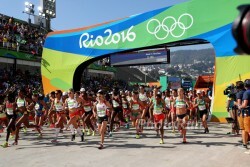 In recent times the favorites for the Olympic marathon for women have not lived up to expectations. The last time a pre-race favorite came through was 1988 when Rosa Mota of Portugal won in Seoul. But top finishers aside, the Olympic marathon has not always been about the three medal-wearing runners who stand on the podium. The true spirit of the Games means being able to make it to the start line and do your very best to represent your country and give hope to the millions of spectators who are watching from all over the world. In the men’s marathon, the silver medalist from 2004, America’s Meb Keflezighi came over the line in 2:16:46 (33rd place)—and found the stamina to do pushups to celebrate his finish. And further back, Methkal Abu Drais of Jordan summoned the courage to not drop out in the challenging conditions with a 2:46:18 showing—good for 140th place, making him the last runner to make it through the full 26.2 miles of this famous event. And she noted a promising trend from the Olympic Games track and field. 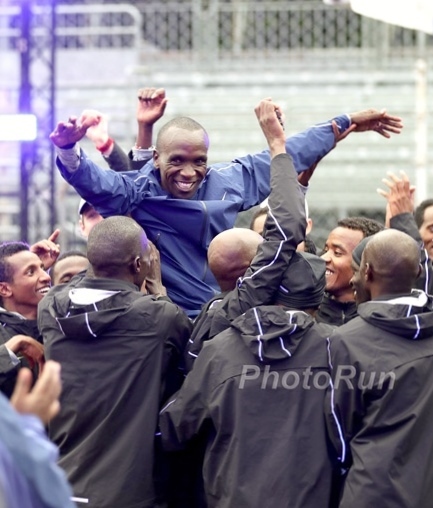 “It was great that the international competitors were able to hang with the great African runners,” said Uta.